I wanted this to sound like the Yardbirds. It doesn't. May your ego rule supreme, you only have the one opinion so it must be right, otherwise there's no point in having it. I stole a page out of your diary. You train them up and you let them loose, never to be seen again. There are so many up there and they're not coming back. I think we should be the first country to launch a zoo into space, complete with keepers and novelty shops. but he pointed to the map and there was no turning back. I wish I could have changed his mind. A glam rock spoof meant to sound like Alvin Stardust or the pop star in question. How did he get away with it for so long? I know lots of people like this style of music but it's played far too often at wedding receptions. Do not criticize. You will then be informed it's a "classic", you have no taste and at least you can hear the words unlike the rubbish that's released today. The music on this track is as far removed from the "motown sound" as possible (so don't worry). that made our parents teeth rot. and you just brutalise and brutalise. The sound of dental drills has always thrilled me. Give me more, gimme, gimme. Aaaaaaah. I walked into a gay club once by accident. The penny didn't drop for a few minutes. The decor was colourful and the drinks expensive. I was wearing a black jacket and by the end of the night half the dead skin off my head was glowing splendidly under the neon lights. and you take what you can get. exclusive to the chemical set. Have you ever met anyone who does completely pointless things purely to drag down the achievements of others? When asked why the reply will inevitably be, "It's just a laugh innit?" This is the story of one such man. Ever organised a get together with friends you haven't seen in ages? Nothing can go wrong can it? then they drop like flies. "Yes dear, no dear," he said. For God's sake man pull yourself together, you're being walked all over. Also get rid of those puppy dog eyes or I'll have you put down. 'Nuff said. Beautiful piece of modern technology rendered second hand in minutes by a series of cheap and cheerful fridge magnets. The new car gets it next. A story of someone who should be dead but doesn't know it. They just keep coming back for more and in the process are having a great old time. It's about Keith Richards really which is why it's an almost blatant rip off of Satisfaction. To freeze or not to freeze, that is the question. I cannot believe the amount of misery this man caused in his life, or indeed death, yet people still adore and are inspired by these lame cartoons. Children also like them, why? Surely a good dose of Warner Bros. would be far superior and is truer to real life (at least in my head). We've all been duped for years. but your children will be mine. Recorded in Bury, England in the year 2006. 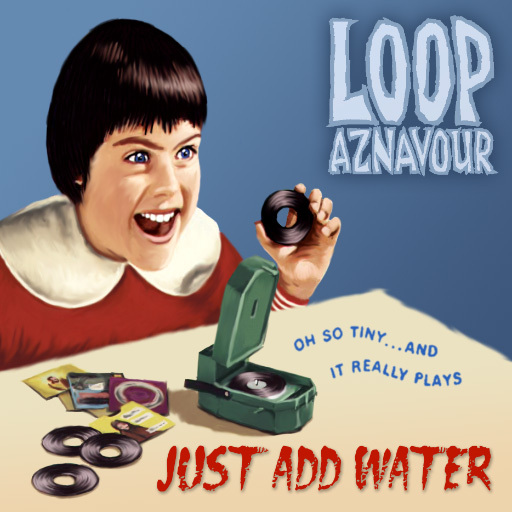 All tracks written and performed by Loop Aznavour. Cover by Loop Aznavour and Ste Pickford. © 2006 Loop Aznavour. Published by Zee-3.